I’m pulling out an old posting today from a few years back, but just changed the information to fit with this years winner, the Kentucky Wildcats. Well congratulations to Kentucky for winning their 8th national championship in basketball. How did you do, our your brackets this year? Did you enter into any contests or competitions with friends? A few of the other youth pastors and I had a group and had a good time talking smack to each other. 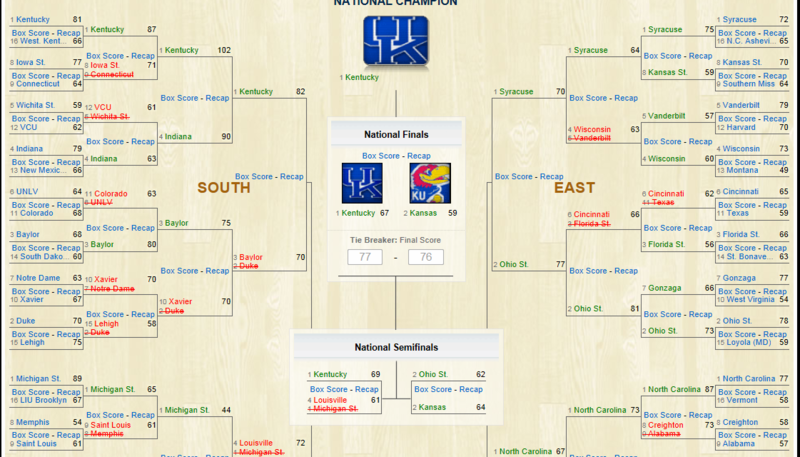 This year I picked 41 out of 63 possible games, had 3 of the final 4 teams in my bracket and picked Kentucky to win it all. Pretty stupid considering that I didn’t watch a single college basketball came all season. According to BookofOdds.com the odds of picking every single game in the tournament correctly are 1 to 35,360,000,000. This is why some of the companies, like Dr Pepper and Yahoo.com, can afford to create excitement by offering a 1 Million Dollar prize if you enter and pick every single game correctly. It’s all about the odds for them and the money involved. Playing the lottery has better odds in most cases. Recently the MegaMillions Lottery had reached the highest it had ever been at an estimated 640 million dollars. According to the official odds you had a better chance at winning the Mega Millions lottery because the odds at picking it were 1 to 175,000,000. Much less than the NCAA brackets. Well now that brings us to Jesus and the Old Testament prophecies about the Messiah. There are over 60 prophecies about this promised Messiah and details of His birth, birthplace, life, death, teachings, His nature, His resurrection, and events after burial, just to name a few. All these are documented in Josh McDowell’s foundational book called “Evidence That Demands A Verdict” or His updated version “The New Evidence That Demands A Verdict” (chapter 8, pages 164-202) Josh McDowell was an atheist who set out to disprove Christianity and the resurrection of Jesus Christ, but as he searched for answers he found out through his discoveries that indeed there was one true living God. In McDowell’s reasearch he brings into the light the work of Peter Stoner in his book Science Speaks. Stoner does a great job at the probability and statistical mathematics of Jesus and fulfilled prophecy. Stoner took just 8 of the probabilities of the Jewish Messiah and figured out the odds at which Jesus or anyone would fulfill them. He came up with a rather large number. The odds were 1 in 10 to the 17 power. That would be a 1 with 17 zero’s after it. [1,00,000,000,000,000,000 ] Stoner gives a great visual example of that number, because it is so big and hard for us to wrap our minds around. Imagine that you fill the entire state of Texas with Silver Dollars 2 feet high. You mark one Dollar with an “X” and then blindfold a man and have him take one guess and find the one dollar with a “X” on it. Keep in mind that this is only 8 of the prophecies and not the entire lot. Stoner’s research has been examined for years now and the mathematics in his work has been found to be solid. Well, where do we go from here? Let me just encourage you whether you are a believer or not, to take a closer look at the life and teachings of Jesus Christ. I am quiet sure you will see something different with Him than with any other religious leader in the world. There is a difference with Jesus because He was who He claimed to be, God. As always your comments, questions, snide remarks are welcome. This entry was posted on Monday, April 2nd, 2012 at 10:58 pm and is filed under General Apologetics, Jesus, science. You can follow any responses to this entry through the RSS 2.0 feed. You can leave a response, or trackback from your own site. Looks like I need to get that book. Sounds fascinating!